Jorge Santiago Rodrigues (Portuguese pronunciation: [ˈʒɔʁʒi sɐ̃tʃiˈaɡu]; born October 9, 1980) is a retired Brazilian mixed martial artist. He was the first Sengoku Middleweight Champion and is the former Strikeforce Middleweight Grand Prix Champion. He has also competed for the UFC, King of the Cage, Titan FC, It's Showtime, and BodogFIGHT. Santiago started his mixed martial arts career at Reality Fighting 2 in 2002 with a win over Jose Rodriguez. In the following years Santago fought for Absolute Fighting Championships, King of the Cage, and a few other small organizations earning an 11–5 record. In 2006 he signed with Ultimate Fighting Championships, where he competed three times. He won his UFC debut at UFC Ultimate Fight Night 5 against Justin Levens by first round KO. 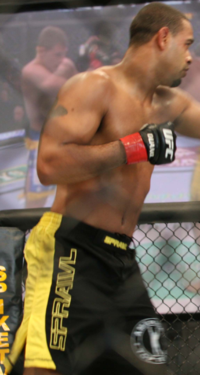 He returned at UFC Fight Night 6 and UFC Fight Night 7, losing by KO to former WEC Middleweight Champion, Chris Leben in the second round and to Alan Belcher by KO in the third round. He then left the UFC. In his first fight after leaving the UFC, Santiago was victorious against Andrei Semenov at the Bodog Fight: Clash of the Nations show in Russia. In his next fight he had to deal with longtime veteran Jeremy Horn and submitted Horn in the first round. The next challenge for Santiago was the Strikeforce Middleweight tournament on November 16, 2007. Competing in the tournament as the underdog, Santiago won the Grand Prix by defeating Sean Salmon and Trevor Prangley on the same night. Continuing on his path of success, Santiago became Middleweight Champion, by defeating Yuki Sasaki, Logan Clark, Siyar Bahadurzada, and Kazuhiro Nakamura. The last two fights were on the same night. Santiago was then crowned World Victory Road's first Middleweight Champion by defeating the acclaimed Kazuo Misaki at World Victory Road Presents: Sengoku no Ran 2009. He was set to face former UFC 12 Heavyweight Tournament Champion and former UFC Light Heavyweight Champion, Vitor Belfort at Affliction: Trilogy, but the match was scrapped after the cancellation of the event. Santiago then fought at World Victory Road Presents: Sengoku 11 against current KSW Middleweight Champion, Mamed Khalidov in a non-title bout. Khalidov won by first round knockout; Santiago's first loss since 2006. He avenged this loss in March 2010 with a split decision victory over Khalidov at Sengoku 12. Santiago defended his title for a second time when he defeated Kazuo Misaki via TKO at Sengoku 14 in August 2010. On February 8, 2011, Santiago requested and was granted his release from World Victory Road. On February 16, he signed a multi-fight contract to return to the Ultimate Fighting Championship. Santiago lost in his UFC return to former WEC Light Heavyweight Champion Brian Stann at UFC 130 via TKO in the second round. Santiago then lost by unanimous decision to Brazilian jiu-jitsu specialist Demian Maia at UFC 136. Following the loss to Maia, Santiago was released from the promotion. On March 2, 2012, Santiago won his return fight, knocking out Leonardo Pecanha with a straight right at 1:48 in the first round at Titan Fighting Championships 21  On June 15, 2012 Santiago fought Justin Guthrie at Titan Fighting Championship 23 winning the fight via submission in the first round. Santiago was re-signed by Strikeforce (now owned by the UFC's parent company Zuffa, LLC) in August 2012, where he was expected to drop to Welterweight for a bout with former King of the Cage Welterweight Champion Quinn Mulhern at Strikeforce: Melendez vs. Healy on September 29, 2012. However, the event was cancelled the following month due to an injury to headliner Gilbert Melendez, and the Santiago/Mulhern bout was not rescheduled before Strikeforce's closure and absorption into the UFC in January 2013. Already signed with Strikeforce, and following his own back-to-back wins outside the organization, Santiago was called back to the UFC to take on Gunnar Nelson in a welterweight bout on February 16, 2013 at UFC on Fuel TV: Barao vs. McDonald, replacing an injured Justin Edwards. Santiago lost the fight via unanimous decision and was subsequently released from the promotion for the third time. Santiago signed with World Series of Fighting in 2013 and made his promotional debut on August 10, 2013 against Gerald Harris at WSOF 4. The bout had a confusing first round where Harris slammed Santiago and Harris believed he had tapped. However, the referee was stopping the action to deduct a point from Santiago for blatantly grabbing the cage during Harris' slam. Following the confusion, the fight continued and Santiago would go on to lose via unanimous decision. Jorge Santiago announced on Dec. 14, 2013 to Ariel Helwani that he has retired from MMA competition. Santiago is married. He has a daughter from a previous relationship. ^ T.P. Grant (June 19, 2012). "Judo Chop: Jorge Santiago's Inverted Heel Hook From Open Guard". bloodyelbow.com. ^ "Jorge Santiago to face Mamed Khalidov in "Sengoku 11th Battle" non-title affair". MMAjunkie. Archived from the original on 2009-10-16. ^ "Demian Maia meets Jorge Santiago at UFC 136". mmajunkie.com. July 15, 2011. Archived from the original on November 10, 2013. ^ Mike Whitman (August 23, 2012). "Thomson-Fodor, Santiago-Mulhern, Two Other Bouts Added to Strikeforce 'Melendez vs. Healy'". sherdog.com. ^ Staff (January 23, 2013). "Justin Edwards out, Jorge Santiago in against Gunnar Nelson at UFC on FUEL TV 7". mmajunkie.com. Archived from the original on January 25, 2013. ^ "Jorge Santiago on life in the USA and getting back to the UFC". Fightersonlymagazine.com. August 9, 2010. Archived from the original on August 4, 2012. Retrieved March 27, 2011. This page was last edited on 19 March 2019, at 08:30 (UTC).